A MarketPlace favorite style. Natural dye hand prints combine in a pop-over top with shirttail hem and side slits. Hand embroidery. • Length: PM 27", M 29"
When Mehmoda began as an embroidery artisan 25 years ago, she was unsure of herself: ÒI would not have believed I had the talent to design embroidery.Ó But staff workers and her fellow artisans recognized that she had skills, imagination and leadership potential. Today she creates original designs for the design workshops. She was also one of 5 artisan who traveled to Kutch for special training. Kutch is famous for fine needlework and Mehmoda was inspired to continue to develop and improve her craft. I love everything about this shirt. The fabric and pattern are beautiful. I bought a 2x and the fit is perfect. I especially love the length. 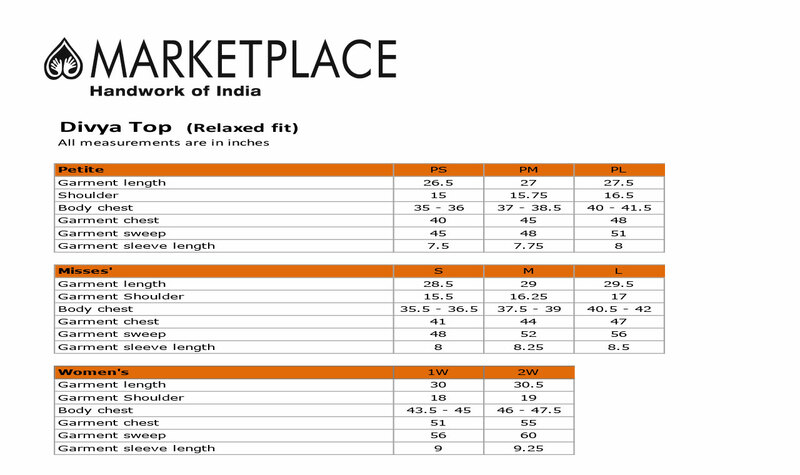 I will buy more shirts from Marketplace India with a 29 inch length.